The Market Development Funds (MDF) program is designed to help AWS Partner Network (APN) Partners drive demand generation and go-to-market (GTM) activities. Through this program, we strive to help APN Partners generate revenue for AWS services by building awareness and pipeline for products, services, and solutions. Typical co-funded activity types include case studies, webinars, online or email marketing, or events like CIO roundtables. MDF activities are not typically standalone activities. Rather, they are more effective as strong calls to action (CTA) that are part of a holistic marketing campaign that includes awareness, demand generation, and channel development activities. In this post, we’ll explore five things you may not know about your MDF benefits. If you have questions about any of these benefits, please connect with your partner representative to learn more. APN Partners at the Advanced tier receive $15,000 in baseline MDF, while APN Premier Partners receive $30,000 in baseline MDF per calendar year. Your MDF is available right now and you can access it via the Acceleration Program page in APN Partner Central. To request MDF, click the launch button on the right side of the page. By default, all Alliance Leads have access to the Acceleration Funding Tool. Please reach out to your Alliance Lead contact to request access. On the Acceleration Program page, you can also register for highly-discounted AWS Training packages delivered by APN Training Partners (ATPs). All baseline MDF benefits are loaded into the Acceleration Funding Tool on January 1 each year. While these benefits are available per calendar year, 50 percent will disappear from your MDF wallet after June 30. This means that MDF not associated with an approved activity will not carry over from the first half of the year to the second half. If an APN Partner is Advanced tier in January, they will receive $15,000. If they reach Premier tier by April, they will receive an additional $15,000 (50 percent of $30,000) in July for the remaining six months of the year. If a Select tier partner upgrades to Advanced in April, they will receive $15,000 (full-year benefit) in May. However, 50 percent of $15,000 or any unused MDF not associated with an approved activity will expire on June 30. If a Select tier partner upgrades to Advanced in July, they will receive 50 percent of $15,000 (half-year benefit) in August. Any unused MDF not associated with an approved activity will be expired on December 31. When it comes to MDF, Amazon Web Services (AWS) recognizes the accomplishments and capabilities of APN Partners that receive and maintain an AWS Competency or join the AWS Managed Services Provider (MSP) Partner Program or AWS Well-Architected Partner Program. These APN program validations mean that additional MDF will be loaded into the Acceleration Funding Tool based on the total number of current designations an APN Partner has achieved. For example, with each AWS Competency, MSP, or Well-Architected designation attained, APN Partners will receive an additional $5,000 of MDF (max of $25,000 per calendar year). On a monthly basis, additional MDF will be loaded into the Acceleration Funding Tool for all net-new APN program designations obtained during the previous month. An exclusive benefit of this additional MDF is that its balance does not expire until December 31, unlike baseline MDF that is subject to 50 percent expiration on June 30. January 1: Advanced and Premier tier prescriptive MDF benefits are available. June 30: 50 percent of the Tier Baseline MDF benefits will expire. December 31: Baseline Tier and Program Validation MDF benefits expire. Unused funds will NOT be carried over to the following year. Partner Content Campaigns: APN Partners or AWS Marketplace Sellers can work with AWS to create custom, co-branded assets such as ebooks, technical solution briefs, case studies, and more. APN Partners can use these new content asset(s) to reach AWS customers and drive leads and brand awareness. Partner Webinar Programs: A comprehensive demand generation engagement offered to a select set of APN Consulting and Technology Partners, along with select AWS Marketplace Sellers. The program features a mutual customer selected by the APN Partner and highlights the unique value proposition the APN Partner’s product or service provides to AWS customers. 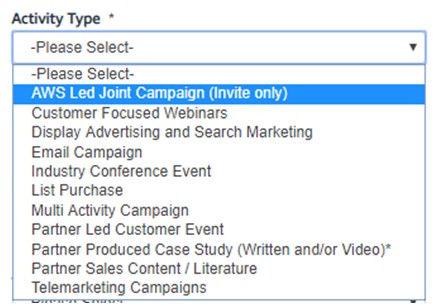 Subject to nomination and budget, these programs are eligible for reimbursement through MDF Benefits by selecting the activity type “AWS led joint campaign (invite only)” in the Acceleration Funding Tool. APN Marketing Central provides marketing tools and resources that enable eligible APN Partners to generate demand for their solutions on AWS. As a benefit to APN Partners at the Select tier and above, AWS provides access to self-service marketing campaigns that allow you to quickly co-brand and launch solution-based campaigns, or engage participating agencies for select marketing services. The goal of our MDF program is to increase APN Partners’ pipeline and accelerate revenue growth. In 2018, for example, we supported a APN Premier Consulting Partner with investment of $40,000 in cash and $14,500 in AWS Promotional Credit funding to run seminars, customer events, and workshops. The MDF investment helped the partner drive 12 qualified opportunities, totaling $564,000 in annualized recurring revenue. The most effective use of MDF is through a holistic marketing campaign with clear CTAs for customers to consider a Proof of Concept (PoC) or migration to AWS as the next step. This is how MDF will accelerate the sales cycle and drive qualified customer opportunities. Small customer event that provides hands-on experience through workshops, seminars, or solution showcases via partner demos. Email campaign to reinforce CTA from customer leads to drive qualified opportunities. A full explanation of all eligible MDF activities can be found in the 2019 APN Partner Acceleration Funding Program Guide located in the “Help & Documentation” section of the Acceleration Funding Tool. In previous iterations of our co-funding programs, APN Partners had to rely on internal AWS partner development contacts to request funding on your behalf. APN Partners expressed frustration over approval wait times, lack of transparency over budget utilization, activity updates, and payment blockers. We heard these concerns and have now made MDF available through a partner-facing system called the Acceleration Funding Tool. Launched in 2018, the Acceleration Funding Tool is accessed through Single Sign-On (SSO) via APN Partner Central. It gives you access to MDF balance directly, and you can view messages from the APN Acceleration Program team, access customizable reporting on activities and budget utilization, and schedule automated reminders of funding expiration. The Acceleration Funding Tool allows APN Partners to see MDF benefits their organization is eligible to receive based on their APN Tier and APN program participation. You can also apply to receive MDF benefits, provide proof of delivery when applicable, and close out funding requests directly from the tool. APN Partners can access MDF benefits today by logging in to APN Partner Central and navigating to the Acceleration Program page. From there, just launch the Acceleration Funding Tool. Learn more about how to access your MDF benefits via the 2019 Acceleration Funding Tool Quick Guide. If you have questions about any of these benefits, please connect with your Partner Development Manager (PDM) or Partner Development Representative (PDR) to learn more.